Sanitation workers drive or ride in garbage truck each day collecting trash from residences and businesses. There are few government jobs people would notice more if the work went undone. 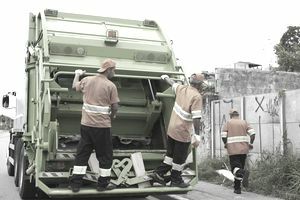 Sanitation workers perform a valuable service to their communities -- collecting garbage and removing it to proper disposal areas such as dumps or landfills. Sanitation workers are predominantly employed in city or county government. The position typically falls within the public works department which has a sanitation department within it. Counties generally contract with private waste disposal companies if they provide garbage collection services to county residents. Most government organizations employ staff or contract with private firms to perform custodial and maintenance duties, but those jobs are different than sanitation worker positions. Sanitation workers are selected through the standard government hiring process, sometimes requiring a civil service exam. They are often selected by the sanitation supervisors who manage them. Before being hired, applicants may have to demonstrate they can meet the physical demands of the job. Postings for sanitation worker positions usually require applicants to have a high school degree or equivalent. If any experience is required, it is typically less than two years. Since these jobs are fairly stable and carry the same pension and benefits as other local government jobs, the wait list to be a sanitation worker may be long. As long as an applicant is able-bodied, ethical and willing to work, the city can teach a new hire all he or she needs to know to be successful in the position. The job is physically demanding. Sanitation workers routinely lift heavy objects and work in all weather conditions. There is also a significant injury risk associated with the job. Not only do heavy lifting and inclement weather take their toll, but sanitation workers also run the risk of being hit by other vehicles. Some sanitation workers drive garbage trucks, and others ride along. Drivers need the appropriate commercial driving credentials for their states. Some cities have trucks that pick up garbage containers and drop the garbage directly into the truck. In other cities, sanitation workers must collect garbage containers or trash bags and manually deposit the garbage into the trucks. Even in cities with more modern equipment, sanitation workers still have to do manual labor. Sometimes the equipment doesn’t work right, or there are items like brush piles or furniture the trucks can't lift. Once a truck is full or the truck’s route is finished for the day, sanitation workers take the garbage to an appropriate disposal facility like a dump or landfill. These facilities have their own staff and equipment to empty the trucks, but sometimes sanitation workers need to help. Obviously, a garbage truck gets dirty in a hurry. Sanitation workers clean garbage trucks on a routine basis. They may perform routine maintenance on the truck such as checking tire pressure, topping off fluids and inspecting mechanical parts for unusual wear and tear. Is a Career as a Correctional Officer Right for You?